Well, more accurately, a lower-fat version of Caesar dressing made without oil and egg yolks. This recipe is from the Moosewood Restaurant Low-Fat Favorites Book. Wow, for a low-fat Caesar this is pretty good. I’ve never made salad dressing before; I like it! The leftover will be really good to dip veggies in! Combine all the dressing ingredients, except the salt and pepper, in a blender and puree until smooth. Add salt and pepper to taste. Cover and refrigerate. Toast the bread slices. Peel the garlic clove, slice it in half, and rub the cut side against both sides of the toast. Cut into 1/2 inch cubes, and lightly toast again on an unoiled tray at 350 degrees. 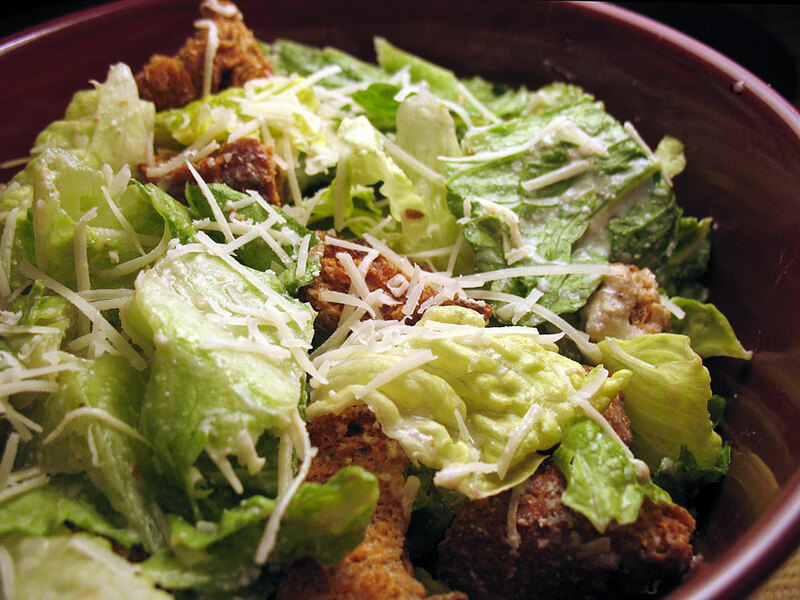 Rinse the lettuce and combine with the croutons. Toss with about 1/4 cup fo the dressing to lightly coat. Sprinkle with the cheese and serve.